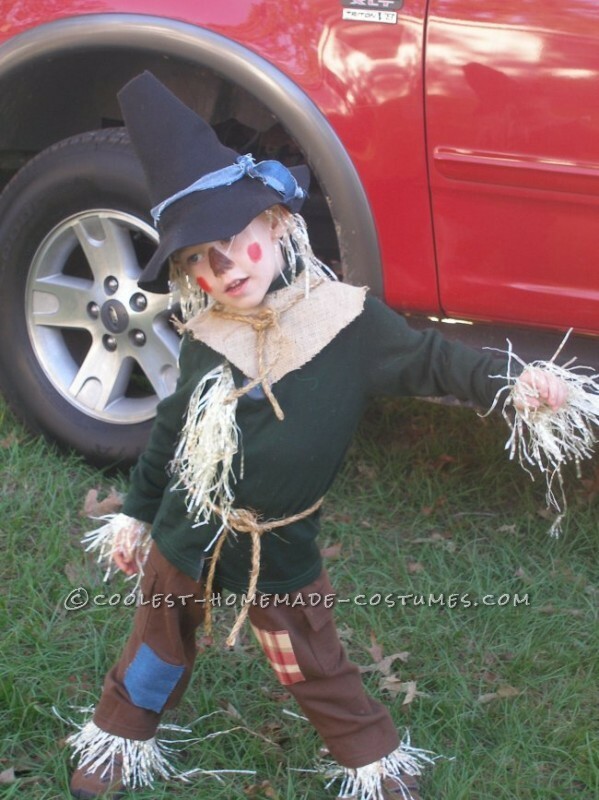 This homemade child scarecrow costume from The Wizard of Oz was my son’s request for a costume. I started by making a hat from black felt. I simply cut a large circle and then made it into a cone. I pushed in the top part to blunt it of and then cut a brim from the felt as well. I needed a turtle neck (you will see why in a minute), but couldn’t find one in the right shade of green, so purchased on in a size too large and dyed it. I then cut it up the middle and sewed one cut edge across the chest so that it met off center, leaving a gap for some hay stuffing. I sewed on a large button just for decoration. I used brown pants we already had and sewed some random patches to them. For the neck piece, I didn’t want anything that could potentially strangle him, so I cut a piece of burlap in a collar shape, leaving a split down the back that could be Velcrod together. I then sewed a piece of rope to the burlap. This gave the illusion of the burlap being tied around his neck, without any of the danger. 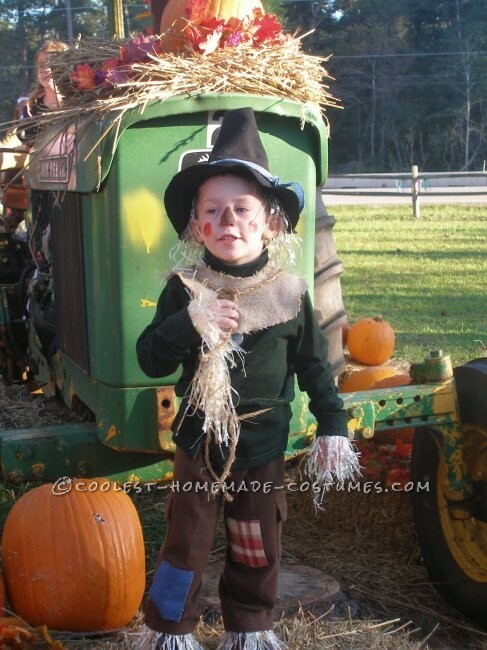 Since he was only 3 and I knew hay would be too itchy and irritating (and NOBODY wants to take an irritated 3 year old trick or treating) I decided to use park of a plastic hula skirt. It mimicked the look of hay without the itchiness. I simply duck taped it inside the hem of his pants and shirt cuffs, as well as inside his hat. I stuffed and taped some in the gap in his shirt as well. 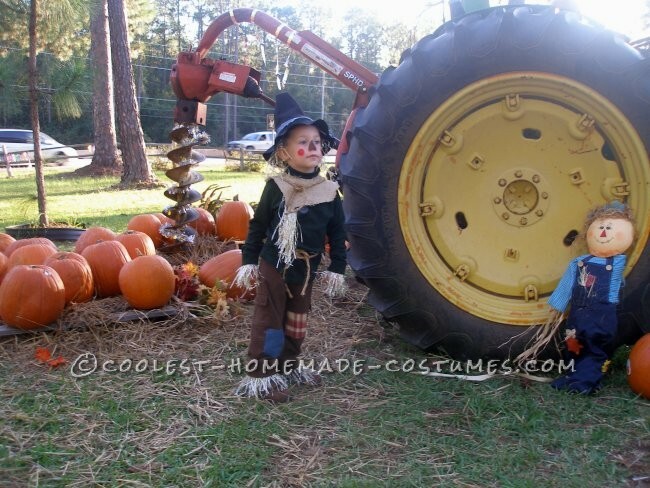 Another piece of rope around his waist and a little makeup to accentuate the cuteness and he was the spitting image of Dorothy’s beloved scarecrow. The cost was nominal and the whole thing went together in a couple of hours. The best part was that he loved it and played the part all night. What a ham!